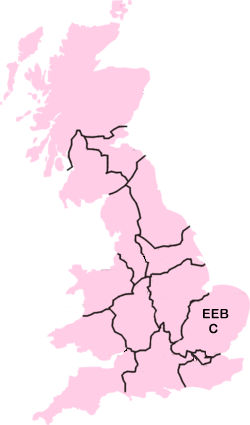 The Eastern Electricity Board (EEB) was formed in 1948 as part of the nationalization of Great Britain's electricity producers, legislated by the Electricity Act 1947. Small letters (1.6mm high), widely spaced. 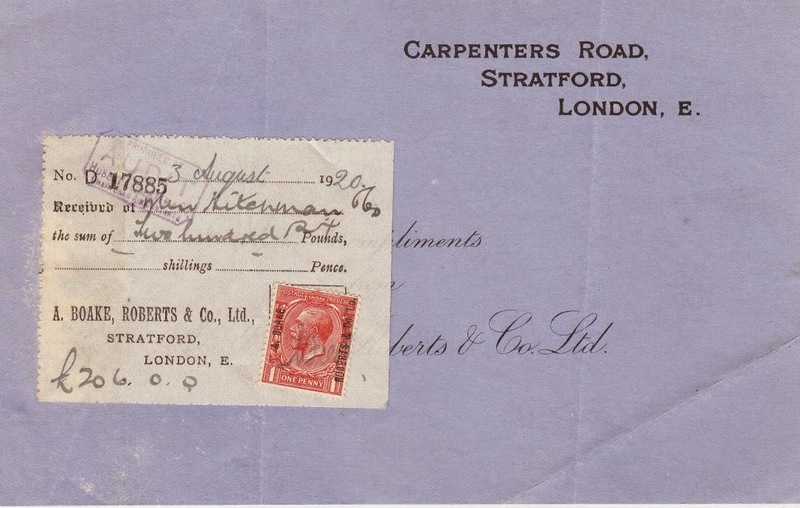 These appear on sideways watermarked stamps from SG 488a to 613ab. Medium letters (2.0-2.2mm high), tightly spaced. 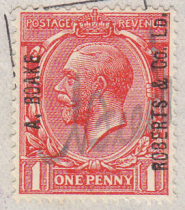 These appear on stamps with normal and sideways watermarks from SG 518a to 613ab, and the unwatermarked SG 727. Large letters (2.8mm high), tightly spaced. These appear on stamps with normal watermarks (SG 579 and 613a) and the unwatermarked SG 726, 727, and 736. Those patterns are read with the stamps on their right side. However, the 2.8mm high pattern is also known read from its left side. Based on receipts I have, the "C" could refer to the Chilterns sub-area (small letters pattern on SG 506a, dated 14 September 1954) or Cambridge (medium letters pattern on 573 or 573a, dated 24 May 1966). It seems that the EEB/C patterns may have been used interchangeably with the more common E.E.B. patterns--in addition to the receipt from May 1966 just mentioned I have an E.E.B. pattern on SG 573 to the same address dated 25 May 1965. 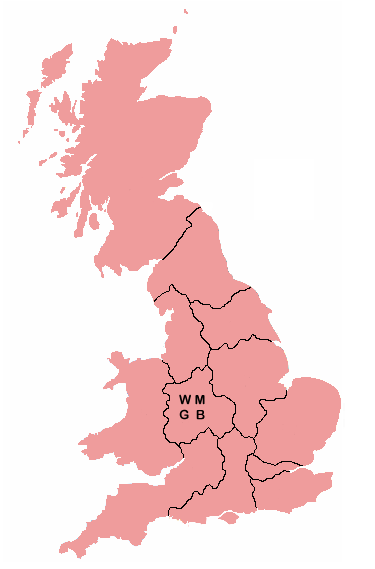 The West Midlands Gas Board was formed by the Gas Act of 1948. From their use of commercial overprints on SG 488, we can infer that they started using overprinted stamps on receipts soon after being established. 573, 573a, 579, 613, 613a, 726, 727, and 736. The 2.0mm pattern is known on SG 573a, 613ab, and 727. The 2.5mm pattern is known on SG 506, 518, 543, 543b, and 573. The 2.2mm pattern is known on SG 488, 506, 543, and 543b. It is very difficult to distinguish between the 2.5mm and 2.2mm patterns by font size alone, but the letters in the 2.5mm pattern are spaced 2.5mm horizontally while those in the 2.2mm pattern are 4.25mm apart. William M. Scholl was a pioneer of foot care in the United States. In 1904 he invented and patented an arch support and founded the company Dr. Scholl's to sell it. Scholl's skill was not limited to his ability to design patented footcare products, but also in his ways to become innovative and inventive in marketing his company. Scholl initially distributed his products via shoe retailers, demonstrating the medical advantages of his designs by using a skeleton of the human foot. To expand his enterprise, Scholl employed salespeople whom he paid more if they studied and passed a podiatric correspondence course. In 1908 Scholl's brother Frank joined the business. 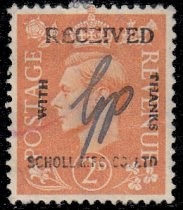 William despatched him to expand the company in Europe, and in 1913 Frank opened the company's first retail store in London called the Scholl Manufacturing Co. Ltd. The London store was a great success and in 1928 William Scholl opened his first retail shop in the United States. By the early 1960s, there were around 100 Dr. Scholl's shops in the United States and over 400 overseas. William M. Scholl died in 1968 at the age of 86, with over 1000 patented footcare products to his name. 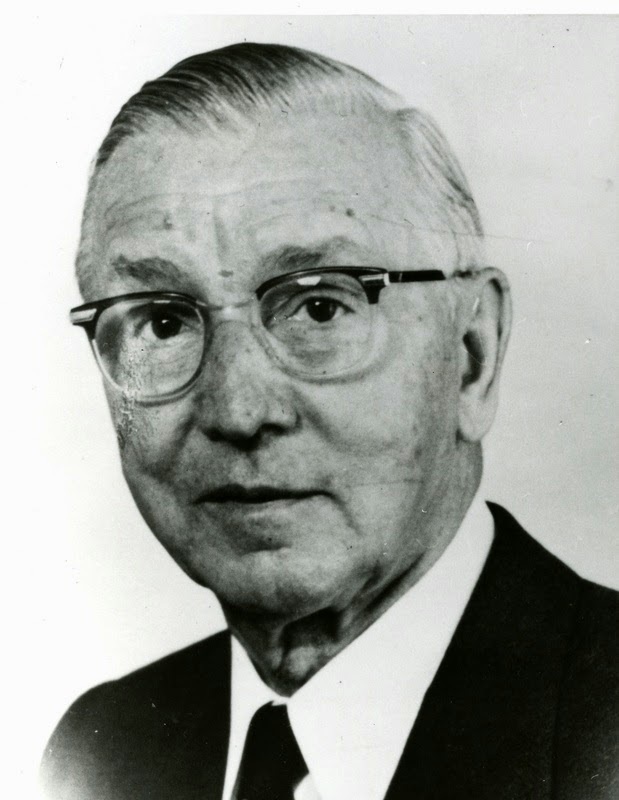 Following his death, Scholl's family sold the company to Schering-Plough. In 1984 Schering-Plough sold the global brand and non-U.S. operations to British company SSL International, who today manufacture footwear and foot care products in China distributed under the Scholl brand. G. B. Kent & Co.
G. B. Kent & Co. have been manufacturers of brushes since the 18th century and are one of the oldest established companies in Britain. Kent Brushes, as the company is now more commonly known, manufacture a wide range of brushes for hair, body, clothes, make-up, teeth and shaving. The company has held a Royal Warrant consistently for nine reigns, beginning with King George III, and today makes over 250 different brushes, exporting to 52 countries worldwide. The business was established by William Kent as W. Kent & Co. in London in 1777. The firm became G. B. Kent & Co. from 1854 to 1900 when George Barton Kent took control of the enterprise. George presided over a massive expansion in the range of products and the quantity of items sold. By the end of the 19th century the firm was making so many bone-handled toothbrushes that they were using the leg bones of 600 bullocks a week. The company became G. B. Kent & Sons Ltd. in 1900. During the First World War, Kent made hundreds of thousands of brushes for the War Office. A soldier's kit included a hair, tooth, shaving, cloth, shoe blacking, shoe polishing, and button brush. The Kent family continued to run the company until 1932 when Eric Cosby, of Cosby Brushes Ltd., took control of the firm. In a top secret operation during the Second World War, Kent made shaving brushes in which maps and compasses could be concealed for forwarding to overseas British prisoners of war to enable them to find their way home in the event of escape. The work was carried out in a special locked and windowless room at the Kent factory with access allowed only to a chosen few. In 1984 the company headquarters were moved from London to Apsley, Hertfordshire, and remain there to this day. 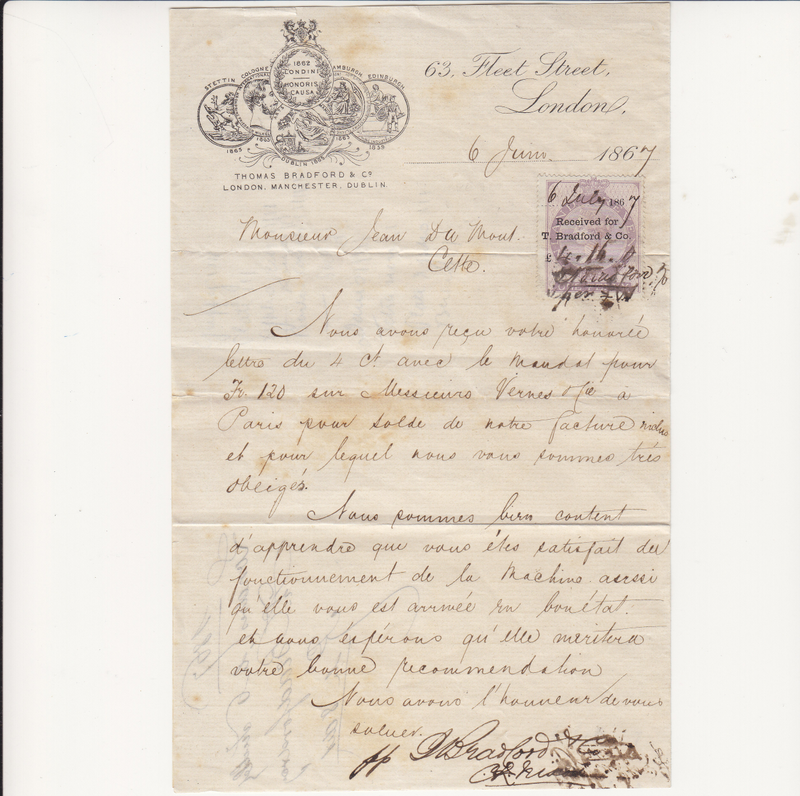 A. Boake, Roberts & Co. Ltd.
A. Boake, Roberts & Co. Ltd. was a firm of manufacturing chemists, established in 1869 when Irishman Arthur Boake founded a company in Stratford, east London, to produce brewing chemicals. Boake invented a product for clarifying wine, which he sold successfully in France, Italy, Spain and Portugal. Boake ran the company alone until 1876 when Francis Roberts joined him in partnership. In 1888 the business became A. Boake, Roberts & Co. and in 1897 it was incorporated as a limited liability company. The firm began to manufacture flavouring essences and to distill essential oils. This evolved into the manufacturing of perfume and flavour chemicals. In 1935, for example, the company published the second edition of A Handbook for Ice Cream Makers. The company expanded greatly in the 1940s and 50s and factories were established in Walthamstow, Waltham Forest, Rainham, Letchworth and Widnes. In 1966 A. Boake, Roberts & Co. Ltd. joined forces with Stafford Allen & Sons and W. J. Bush & Co. to form Bush Boake Allen. By the end of the 20th century, sales for the company had reached $470 million. In 2000 an American company named International Flavors & Fragrances Inc. (I F F) purchased Bush Boake Allen for $970 million, making I F F the largest flavour and fragrance producing company in the world. Boake's original factory in Stratford was demolished and cleared for the 2012 London Olympics. In 1860, William Valentine Wright, with partners Sellers and Layman, opened a small wholesale druggist and chemist business at 11 Old Fish Street Hill near St. Paul's Cathedral in London. 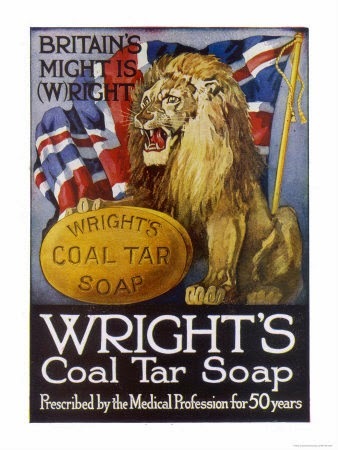 In 1866 the company developed Wright's Coal Tar Soap, which was to become a hugely popular brand of antiseptic soap that is still being sold today. The soap was made from liquor carbonis detergens, the liquid by-product of the distillation of coal to make coke; the liquid was made into an antiseptic soap for the treatment of skin diseases. Sellers retired in 1876 and Charles Umney was taken into partnership, and the company's name was changed to Wright, Layman & Umney. At this time the firm was described as wholesale and export druggists, manufacturers of pharmaceutical and chemical preparations, distillers of essential oils, manufacturers and proprieters of Wright's Coal Tar Soap and other coal tar specialities. William Valentine Wright died in 1877 and two of his sons, Charles and Herbert, subsequently joined the company. By 1898 Charles Umney had taken over the management of the coal tar soap section of the business. In 1899 Wright, Layman & Umney became a private limited company and moved to larger premises in Southwark. In 1909 the firm became a public limited company and was regarded as one of the leading pharmaceutical companies in the country. In the late 1960s, the Wright's Coal Tar Soap business was taken over by LRC Products Ltd. who sold it to Smith & Nephew in the 1990s. The soap is now made in Turkey for the current owners of the brand, Simple Health & Beauty Ltd. based in Solihull and is called Wright's Traditional Soap. As European Union directives on cosmetics have banned the use of coal tar in non-prescription products, the coal tar derivatives have been removed from the formula, and replaced with tea tree oil as the main anti-bacterial ingredient. Despite this major variance from the original recipe, the new soap has been made to approximate the look and smell of the original product. Thomas Bradford & Co. was a company of laundry and dairy engineers established in Salford in 1850. The company made dairy appliances and butter churns but is most noted for being one of the first major manufacturers of washing machines in Victorian Britain. 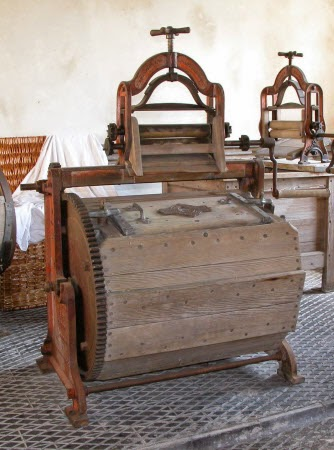 The first reference to a washing “machine” can be traced to the diary of Robert Hooke in 1677. It described “a way of rinsing fine linen in a whip-cord bag, fastened at one end and strained by a wheel and cylinder at the other.....whereby the finest linen is washt, wrung and not hurt”. This is hardly what we would describe as a “machine”, yet this word was used in country house inventories of the 18th and early 19th centuries, which sometimes referred to “scrubbing engines” or “washing machines”. It was not until the 1860s that washing machines as we would recognize them began to be sold in any number. These early machines were wooden-bodied, hand operated and showed a wide variety of forms, most incorporating wringers. One of the major manufacturers of early washing machines was Thomas Bradford. Bradford's distinctive motif can be found on many washing machines in museums and reconstructed laundries, as well as on box mangles, ironing stoves, linen presses and butter churns dating from the second half of the 19th century. Thomas Bradford founded his company in Salford in 1850 and later set up a steam laundry in London. The company's Victress Vowel series of washing machines was undoubtedly the most popular of its day. One of the features of the Victress Vowel series was that it was produced in a number of different sizes to suit different workloads. The most popular was the “E” model, designed for family use and costing 8 guineas in 1862. The “O” model was larger, designed for hotels, schools and mansions and the “U” model for large hotels, hospitals and workhouses. For these largest machines, Bradford advised specialist installation and operative training and eventually it was in this direction that the firm developed. At the Royal Jubilee Exhibition in Manchester in 1887, Bradford's stand consisted almost entirely of commercial laundry and swimming-bath machinery, steam driers and disinfecting equipment. 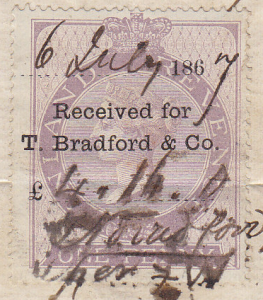 Thomas Bradford & Co. continued until at least 1938. Victress Vowel washing machine made by Thomas Bradford & Co.